There are occasions in life when you need… that little extra something. Your honeymoon is definitely one of those occasions. It’s the trip worth that extra money, that upgrade, that five-star experience you may have denied yourself before. Luckily, here at weddingsonline, we have plenty of honeymoon suppliers ready to dazzle you, whether you want to travel near or far. 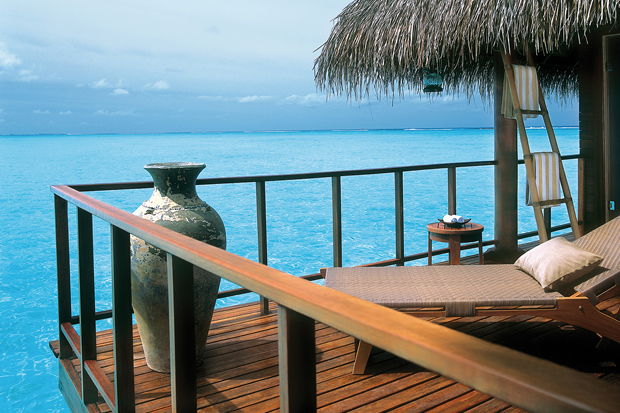 Presenting – our top choices of honeymoons for luxury lovers. You need to remember this trip forever, and here are the places that guarantee beautiful memories. Looking at it from Ireland, Rodrigues couldn’t be more different than what we’re familiar with, in practically every way. The island is just 18km long and 8km wide, but with so much beauty packed into one tiny area, it really deserves its nickname of ‘the jewel of the Indian Ocean’. It’s been called many other things too, like ‘the paradise of kindness’, and the ‘Mauritius of 25 years ago’. No tourist trappings, no unbearable crowds… just blue everywhere, plus lush green and white. It looks like one of those photos at a travel agent’s office, so perfect you’re sure it’s been digitally altered. 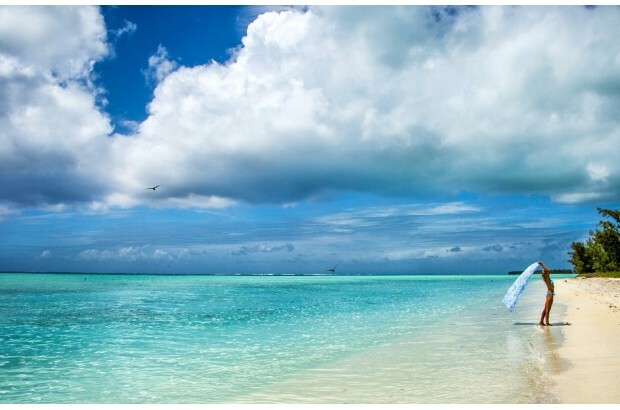 In fact, Trou D’Argent, a must-visit place in Rodrigues, has been ranked among the 30 best preserved beaches in the world. The Guardian called it ‘a place even your best-travelled friend may not have heard of’. That’s enough endorsement for a truly unique honeymoon. Lush, lovely and laid-back, St Lucia in the Caribbean will have you smiling from your exotic breakfast to champagne sunset, every day. You can simply spend your time admiring everything it has to offer, like the Piton Mountains with their UNESCO World Heritage Status. Or dive into the many activities, like water sports and dolphin spotting, pirate ship cruises, mountain biking through the rainforest, or visiting a plantation. 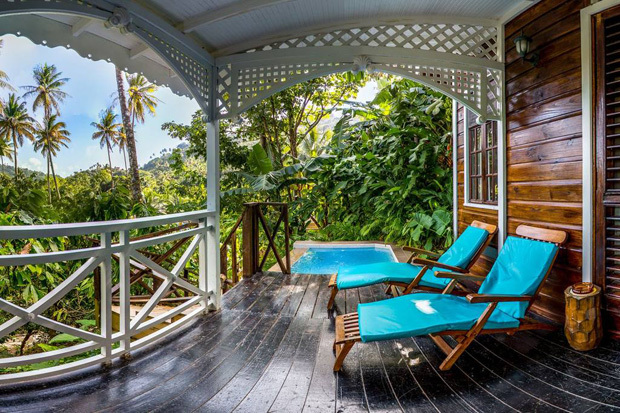 Of the last, we’re lucky to have the Fond Doux Resort among our honeymoon destinations. This 250 year old plantation is the ultimate in secluded luxury, with a romantic ambiance ideal for newlyweds. The flights from Dublin are long but surprisingly inexpensive, even in autumn. But don’t worry about the weather, their September is just as hot and lovely as their August. The Republic of Maldives is also known as the Sunny Side of Life. Honestly, doesn’t that just make you smile? 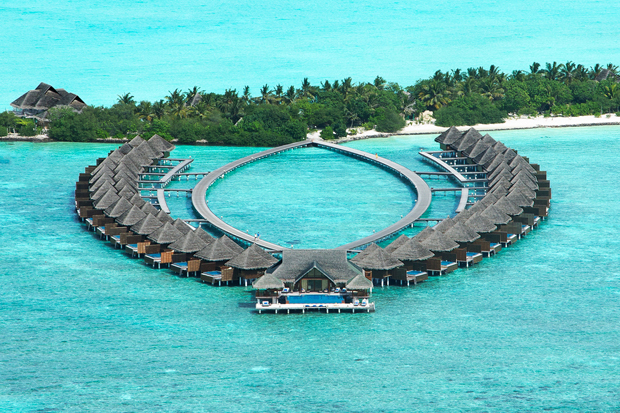 Tiny in size, and located in the Indian Ocean, it’s the perfect escape from everyday life. To come here, all you need is a desire to run away somewhere different, but with a well chosen place to stay once you arrive. That place is the Taj Exotica Resort & Spa, located in the middle of one of the largest lagoons in the Maldives, among the coral reefs. If you expect the very best, then the very best you shall have, in every part of your stay. Get pampered, fed, indulged and entertained to your heart’s content – and when you feel completely rejuvenated, do something special like wildlife spotting, parasailing or snorkeling. The only thing better than the stories you’ll come back with will be the pictures, guaranteed! 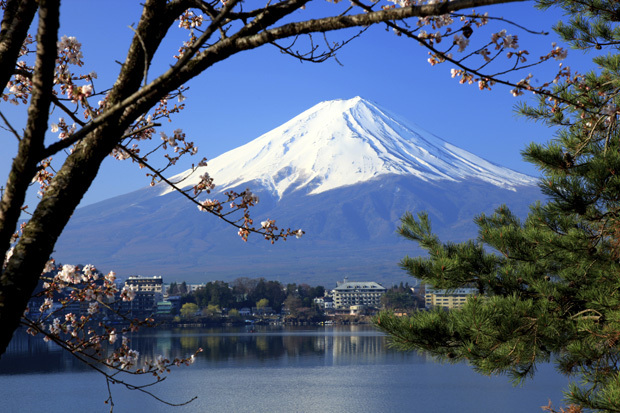 Unique Japan Tours, a specialist travel agency based in Dublin, takes you right to the heart of the very best Japan has to offer. Do you know anyone who came back from this fabulous country and didn’t rave about it? We don’t, and that makes it a top honeymoon destination in our eyes. There’s endless fascination with Japan’s lifestyle, food and entertainment, and it’s best experienced first hand. Complete planning flexibility means you can arrange any type of tour, including themed, individual and in a small group. Choose popular places like Tokyo, Kyoto and Osaka, or go off the beaten track to Amami Island, Nikko World Heritage Site, or to Northern Japanese Alps. Give yourself plenty of time to take it all in, because it truly will be the trip of a lifetime. The most exciting waterfront location on the upscale Al Maryah Island is undoubtedly the Four Seasons Hotel Abu Dhabi. We’re not exaggerating when we say you could spend the first week of your honeymoon just checking out the hotel amenities: they have six restaurants and lounges, a day spa, an outdoor swimming pool with terrace, and more, all at five-star luxury levels. 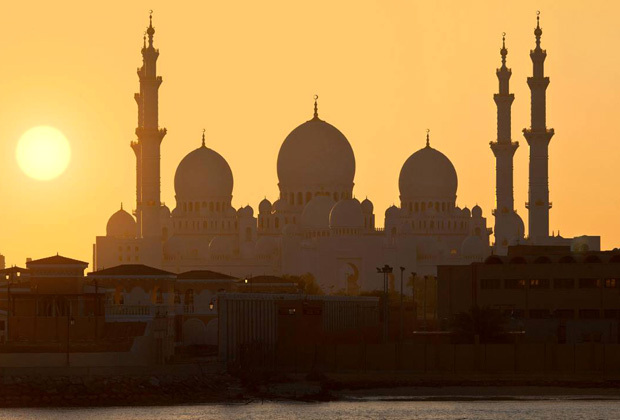 When you finally decide to venture outside, you’ll find the famous Sheikh Zayed Grand Mosque (above), Emirates Palace, the Falcon Hospital, and of course the breathtaking views from the Observation Deck at 300 – the highest observation point over the city landscape that will give you a serious thrill. Honeymoons for luxury lovers don’t get any more exotic, or sumptuous, than this. While Mumbai is on most people’s must see list, it’s not the only option of honeymoons for luxury lovers, especially if you want to avoid major crowds and big city bustle. 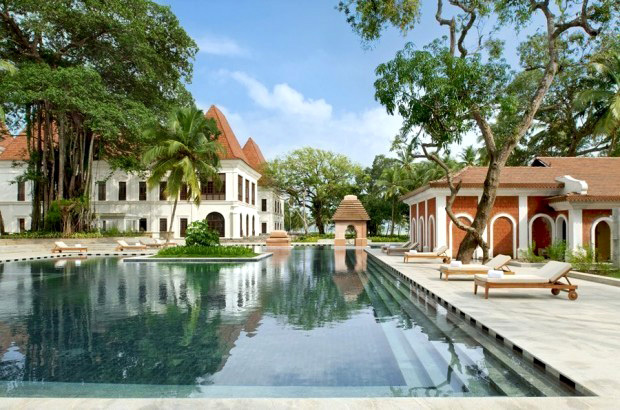 Consider going to Goa instead, and staying at the Grand Hyatt Goa, just 7km from the capital city of Panaji. You may not know this, but Goa was once a Portuguese colony, and as such it features a spectacular blend of Indo-Portuguese architecture. In fact, the Grand Hyatt is housed in a 17th-century Indo-Portuguese palace, for a fantastic combination of warmth and grandeur. If you prefer, you can stay at the hotel the whole time and you won’t be bored at all. When you’re ready to venture out, the hotel has over 100 activities and experiences to enjoy, including hot balloon rides and spice plantation visits. Great stories upon return to Ireland guaranteed! Rather than a single destination, Royal Orchid Hotels is a group of 12 remarkable properties scattered around the most attractive locations: Bangalore, Mysore, Pune, Jaipur, Goa and Hyderabad, among others. This is a perfect arrangement for those who don’t want to stay in one place for too long. We’re talking honeymoons for luxury lovers while you’re on the move. You could travel around India and stay at each Royal Orchid Hotel, knowing the same superior service and comforts are waiting for you wherever you go. 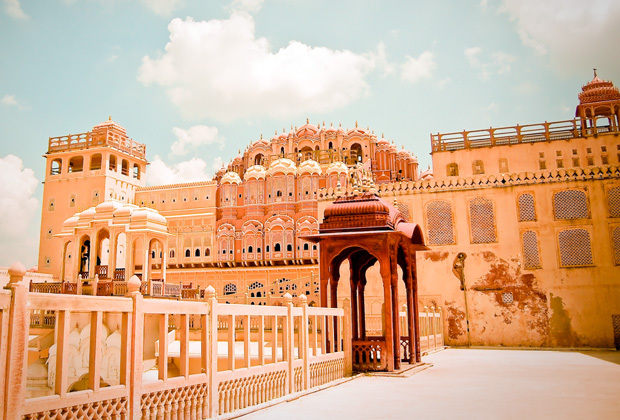 In between, you’ll enjoy sights like the Palace of the Winds (Hawa Mahal) in Jaipur… Keshawa Temple in Mysore… and the religious site of Shreemant Dagdusheth Halwai Sarvajanik Ganpati in Pune. Not a dull moment guaranteed! Our friends at Canadian Sky and American Sky know all about honeymoons for luxury lovers, anywhere in North America. Pick either country, and you’re faced with an enormous choice, and not just because they’re huge. We already covered some of the more unique ideas in our 6 Awesome American Honeymoons You Didn’t Know You Could Have article, but of course there are many more. 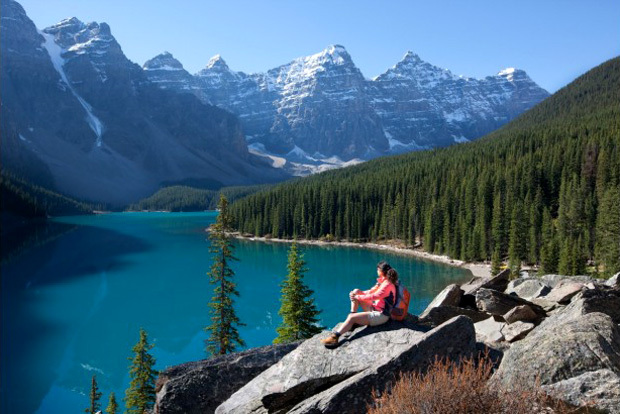 Canada is particularly famous for its wild natural beauty, as an alternative to popular city destinations like Toronto or Vancouver. We particularly recommend seeing Canada by rail, for a combination of first-class luxury and astoundingly beautiful landscapes. 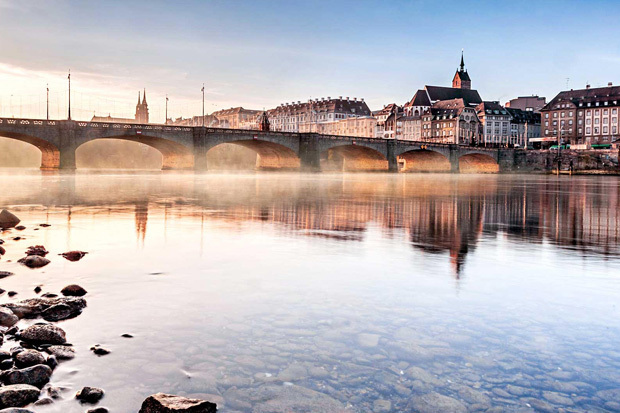 There’s a multitude of other types of tours to experience – consider yourself spoiled! 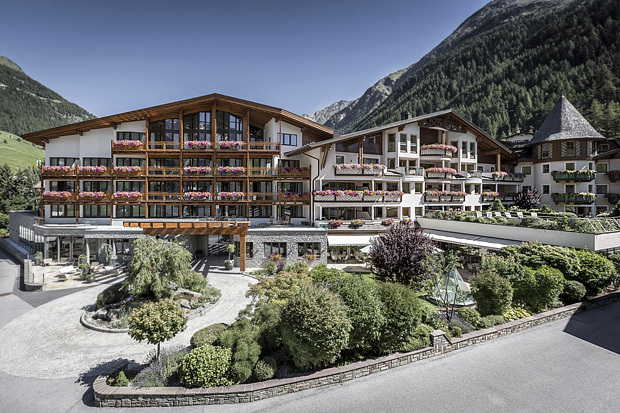 Experience Alpine Luxury Life the way it’s meant to be, at Das Central luxury hotel in Solden, in the Tyrol region. Famous for hospitality and cuisine, it will be the honeymoon to remember with the highest levels of 5-star casual luxury. You don’t have to be a skier or a climber to appreciate the beauty of the Alps, and to benefit from the healthy mountain air. In fact, this could be your perfect wellness break. The hotel has a mind-blowing 16 rooms offering all kinds of treatments, and you can easily incorporate a wellness package into your holiday. Others go on yoga retreats, spa days or pampering weekends… you’ll enjoy the rejuvenating power of mountain air and healthy food. Das Central has won a multitude of awards, especially as one of the Top 25 Luxury Hotels in Austria from TripAdvisor, and Best Wine Hotel 2016 by Vineus Wine Culture.